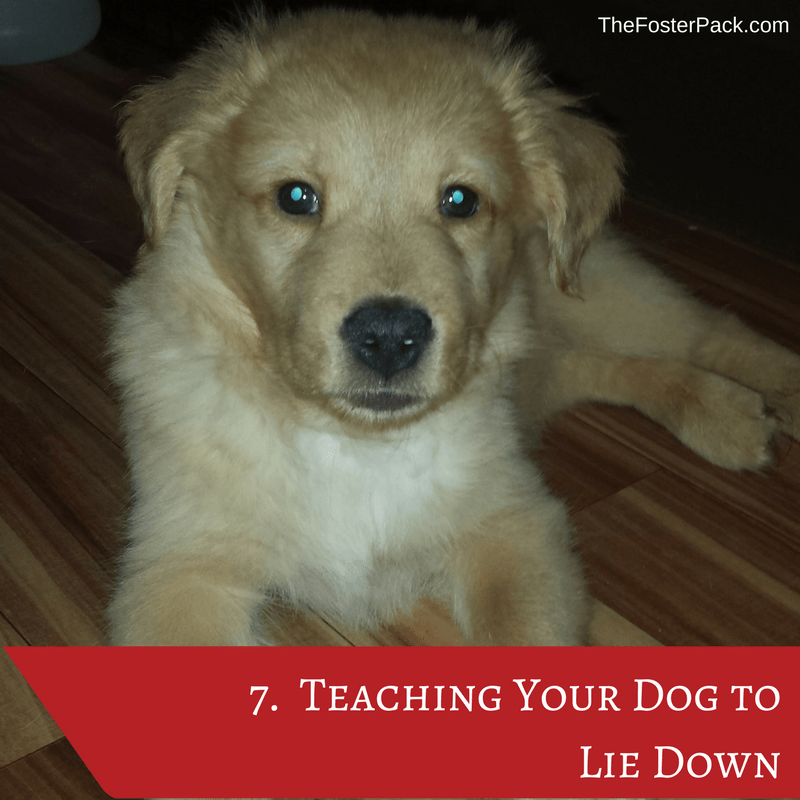 Teaching your dog to Lie Down is almost as easy as sit. Dogs like to lie down, it’s another natural behavior. It’s great if you need to put your dog into a stay position for more than a few minutes. And it’s the starting off point for other dog tricks, such as Roll Over. Get out your [amazon_textlink asin=’B01KPSJE9Y’ text=’high value training treats’ template=’ProductLink’ store=’fosterpack-20′ marketplace=’US’ link_id=’c2c43f38-4cdb-11e8-ba2c-93bdf8d7010b’] ready again. Small pieces of cheese or hot dog work great! And find a quiet place with few distractions. Some people like to start Lie Down from a sitting position, others from a standing. If you wish to start from a sitting position, I find this to be helpful, then have your dog sit. He should be doing this without the need for a treat. Next hold a training treat in front of his nose, and slowly move it towards the ground, and towards you. His nose should follow the treat, naturally putting him in a lie down position, if it doesn’t try a higher value treat. As soon as your dog’s elbows and hocks hit the ground, give the Lie Down command, and immediately give him the treat and some praise. Repeat, for a few minutes. And practice daily until he gets the hang of it. Again, if you have a stubborn dog, you can train by marking the behavior. Carry treats with you, and as soon as you see your dog starting to lie down, give the command, a treat, and lots of praise. This should be pretty easy, dogs spend a lot of their time lying down. Once your dog gets good at the Lie Down command, start working on making him stay longer before he gets the treat. And it’s a good time to start working on the Stay and Okay/Go (release) dog training commands.